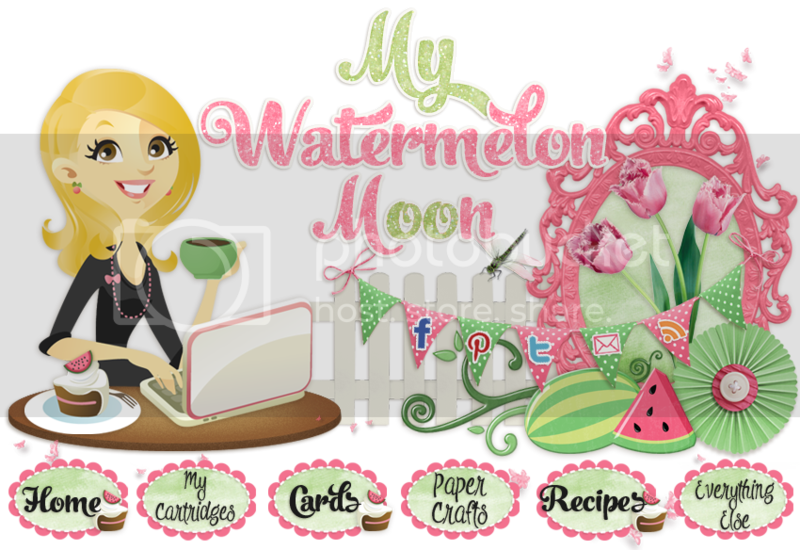 My Watermelon Moon: So Excited!!!! I have a couple of reasons to celebrate tonight! First, LOOK just a couple away from 50 followers! Send your friends! I think I may have a small give away for my first 50 fans! Wouldn't that be fun? Sadly the picture doesn't do it justice, but it was the best I could do tonight. It had to be submitted by Midnight... and I barely made it! Nothing like waiting till the LAST possible minute, but that's how I roll pretty often. I seriously had a blast making this! Super cute project. I can't wait to get Create a Critter 2 and the Teddy Bear Parade cartridges as they look adorable. I just became follower #49 and tried to follow your blog via email only it said that it's not enabled??? Anyway TFS & God Bless. Yay! I love new crafty friends! And yes, oh my! both cartridges are adorable! Great job, you've inspired me to do something like this for my front door. This squirrel is my favorite little guy! I love the wreath! Not sure what I am going to do with him...yet! Thank you so much! I totally linked up! :D Thanks for stopping by! What a gorgeous and super cute wreath! I am so excited for Create a Critter 2! Thanks for playing along with us at Cut It Up Challenge!!! I enjoyed making it and the new CAC2 makes it easy! Thank you! I will come check out the party! Well, how cute and creatiThank you for playing at Cut it Up, and I hope we see you again and again!!ve!! How cute!! I love this wreath!! My favorite is the little bird with the twine!! Thanks for joining us at Cut It Up Challenges! Thank you Kimberly! I hope to enter more Cut it up challenges too! great wreath!! It does look like a fun cartridge - good luck!! Thanks for joining us at Cut It Up Challenges!! Thank you! :) I look forward to more fun with cut it up! Ok, that is an awesome wreath - want to make me one too while your at it :) Great work! Thanks for joining us this week at Cut It Up Challenges! It is gorgeous! I love all the cuts and I am also really excited for the new Create a Critter cartridge!! Fantastic wreath! Thanks so much for playing along with us at Cut It Up Challenges! How sweet Kathy! Glad I could join you at your first Link party :D Glad we were already friends! It's absolutely adorable. I just love fall colors. I think my favorite cartridge is Create A Critter. I have CC2 on order. I'm your newest follower. Hope you'll visit my blog and follow if you like. Hi Tara! Already a follower! :D I loved your blog so much I hired Sarah! I'm your newest GFC follower!! Congrats on passing 50 followers!! Great wreath--I want to do something like it!! It looks like the little birdies are pulling the word "Fall" up into their nest! So cute! Thank you! I love to add birds where I can and they needed a job :D thanks for visiting. Really cute! Your co-host and newest follower! Yeah!! I am your 60th follower. Awesome wreath. 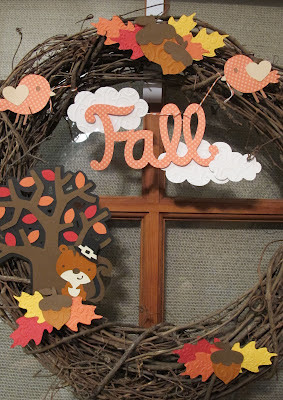 I keep thinking I am going to take some time and make a fall wreath. I love yours. Hi there! New follower from the Mom's Monday Mingle.. Hope you can follow back as well :) Have a great day! Hello and welcome! I am following you back on GFC. I definitely think you are a contender! This is so cute and fun! Thanks so much for joining us at Cut It Up! This is such an adorable wreath! Hi Cassie! Following you on GFC and FB :)Thanks for stopping by! Thank you Kathryn! :D and Thanks for visiting! Thank you Janis and Thanks for visiting! I love this wreath!!! 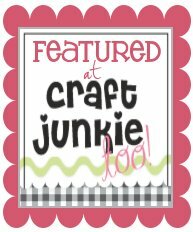 Hi new follower from http://craftyhousemom.blogspot.com and I would love it if you would visit! I love your squirrel pilgrim! Great job on the wreath, and the tree looks great, too! Thanks for entering our very first challenge at Cut It Up! What a lovely wreath! The birds are adorable. Visiting from Life on Lakeshore Dr linky party and am a new follower through GFC. Hope you can follow back. Tuula! Thank you. I am following you back on GFC. Thanks for linking this great post to the Say G'day Linky Party. Super cute! I love the birdie and the tree! 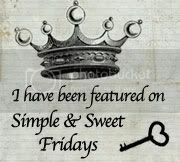 So glad I found your site (via Dixie 'n Dottie and their link party.) 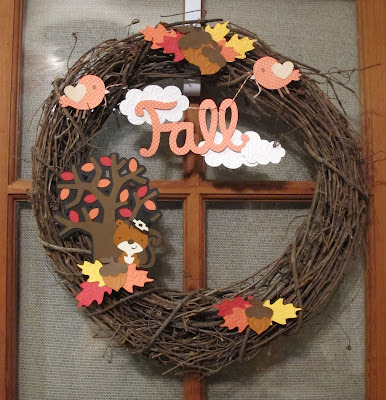 Your Fall wreath is precious - it's so much fun to visit other blogs and see how they decorate for the season. Great job!